Hot Peppers are a mainstay in Caribbean cuisine. If you want to add some authentic Caribbean flavor to your dinner, our JCS Hot Crushed Peppers will get the job done right. It’s intensely spicy, with a fresh and delicious taste that is so good you’ll have tears of joy running down your face. 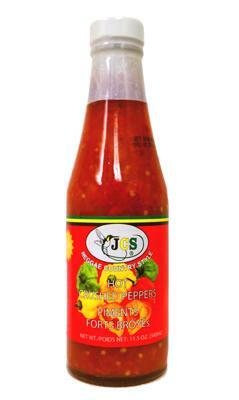 When it comes to your hot sauce selection with the notorious Jamaican kick to it, look no further! Want to know more fun facts about the Hottest Pepper in the world?